The outcome of any sporting event has many variables. But when there are only two participants, the confidence level of the opponents plays a significantly larger - and thus a particularly predictive role. 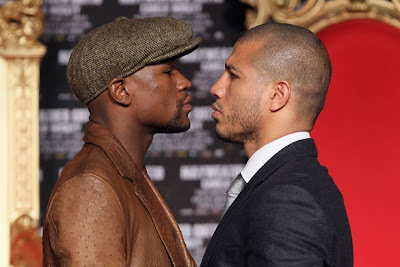 An analysis of the body language of both Floyd Mayweather and Miguel Cotto at their weigh-in yesterday, demonstrates Mayweather has significantly more confidence. Based on this alone, and no other variables, it indicates Floyd Mayweather will win this boxing match. While there are many nonverbal indicators in this video, two moments of contrast are especially notable. During the 4:33- 4:36 time mark, when Mayweather gets weighed and strikes the bilateral arm flexed boxers' pose - he displays a sincere smile - with its required relaxed forehead. Cotto at his corresponding moment (5:19 - 5:21) and pose - signals us with a frown and a contracted central forehead. While his consciousness can flex his biceps - his true emotions leak out on face (subconsciously displayed). He is experiencing emotional pain. He is not confident at this weigh-in and his body language screams it out. Secret # 252: What do Over-Rated Actors, News Reporters and Insincere People have in common?